· Ordeal tree, Tangena nut, Pong-pong. It is a small tree that grows well in South India, especially Kerala. It bears fruits which resemble unripe (green) mangoes (Fig 25.8). The fruit contains generally two hemispherical seeds with a tough, horny, granular envelope (kernel). The kernel is rounded on the outside, and flattened or depressed about the centre on the internal side. It is formed of two unequal cotyle-dons, the external surrounding the internal and a short ascending radicle. The seeds are employed in folk medicine as an emeto-cathartic, while the bark, the latex (rich in caoutchouc) and the leaves are used as purgatives, but all are dangerous. 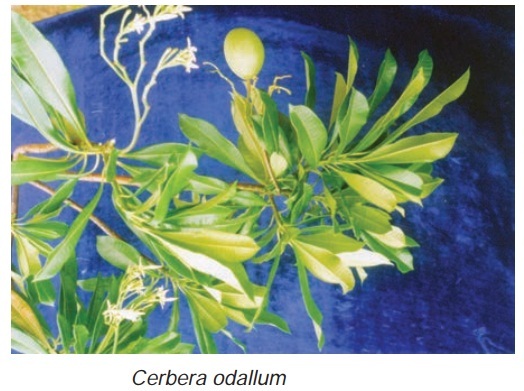 Cerberin: The seeds of Cerbera Odallum contain a colourless crystallisable glucoside Cerberin. It yields with dilute acids Cerberetine, which is equally toxic and of a handsome yellowcolour. The seeds contain 77% fixed oil. Cerberin is very toxic, especially on the heart. It blocks the calcium ion channels in heart muscle, causing disruption of the heartbeat. Manifestations of poisoning as well as treatment are the same as that for oleander. Cerberin is difficult to detect in autopsies and its taste can be masked with strong spices. Therefore it is a common method in both homicide and suicide in India (especially in states like Kerala). Accidental poisoning may result from mistaken iden-tity (with unripe mango) (Fig 25.9).